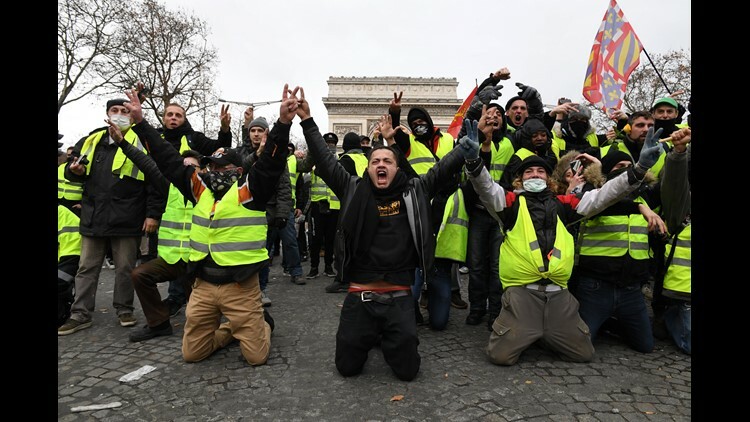 Demonstrators kneel and gesture with victory signs as they take part in the demonstration of the yellow vests at the Arc de Triomphe on December 08, 2018 in Paris France. ''Yellow Vests' ("Gilet Jaunes" or "Vestes Jaunes") is a protest movement without political affiliation which was inspired by opposition to a new fuel tax. After a month of protests, which have wrecked parts of Paris and other French cities, there are fears the movement has been infiltrated by"ultra-violent" protesters. Today's protest has involved about 5,000 demonstrators so far, who have gathered in the Paris city centre, and police have made at least 211 arrests so far. 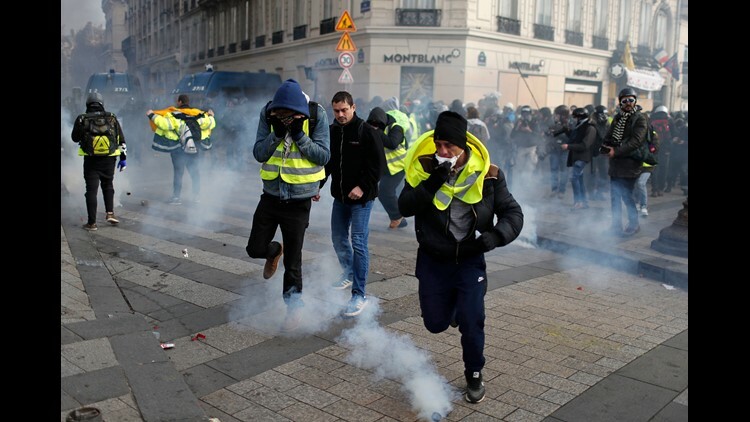 PARIS – The rumble of armored police trucks and the hiss of tear gas filled central Paris on Saturday, as French riot police fought to contain thousands of yellow-vested protesters venting their anger against the government in a movement that has grown more violent by the week. A ring of steel surrounded the president’s Elysee Palace – a key destination for the protesters – as police stationed trucks and reinforced metal barriers throughout the neighborhood. Saturday’s yellow vest crowd was overwhelmingly male, a mix of those bringing their financial grievances to Paris – the center of France’s government, economy and culture – along with groups of experienced vandals who tore steadily through some of the city’s wealthiest neighborhoods, smashing and burning. Demonstrators wearing yellow vests run away after police fired teargas during a protest in Paris, Saturday, Dec. 8, 2018. Prized Paris monuments and normally bustling shopping meccas locked down Saturday and tens of thousands of police took position around France, fearing worsening violence in a new round of anti-government protests. The French government’s plan was to prevent a repeat of the Dec. 2 rioting that damaged the Arc de Triomphe, devastated central Paris and tarnished the country’s global image. It did not succeed, even though it was better prepared. Although Saturday’s protest in the French capital started out quietly, tear gas choked the Champs-Elysees Avenue by early evening. An estimated 125,000 people had demonstrated around France while 10,000 took their anger to the streets of Paris, double the number in the capital last week, he said. Toughening security tactics, French authorities deployed 8,000 security officers in the capital alone, among the 89,000 who fanned out around the country. A Starbucks near the Champs-Elysees was smashed wide open and protesters were seen stepping over broken glass and serving themselves to beverages. The window of a nearby bank was smashed in with a wrought-iron decoration used to encircle city tree trunks. All of the city’s top tourist attractions – including the Eiffel Tower and the Louvre museum – shut down for the day, fearing the kind of damage that hit the Arc de Triomphe a week ago. Christmas markets and soccer matches were cancelled. Subway stations in the city center closed and the U.S. embassy warned citizens to avoid all protest areas. France’s yellow vest protesters have political stances ranging from the far right to the far left but the leaderless group is united in its sense that Macron and his government are out of touch. Some protesters sang the French national anthem – “The Marseillaise” – as they confronted phalanxes of police in heavy riot gear. One protester in Paris showed an Associated Press reporter a fresh wound on his jaw, saying a rubber bullet fired by charging police had glanced his face. “I was running with my hands up. They charged,” said Ludovic, a 38-year-old cabinetmaker from the eastern city of Colmar. He only gave his first name, saying he feared being tracked by security authorities. He said he was fleeing the Champs-Elysees, choked with tear gas, when police moved in. Even as blue armored trucks rumbled over cobblestone streets in Paris, a larger environmental march took place peacefully Saturday toward the city’s Republique Plaza. Cyril, a 25-year-old garbage truck driver, came from Normandy with three others. He said he earns only 1,430 euros ($1,625) a month despite working 45 hours a week and has decided not to have children because doesn’t feel he can earn enough to raise them. This was his third weekend of protesting in Paris. Macron on Wednesday agreed to abandon the fuel tax hike, which aimed to wean France off fossil fuels and uphold the Paris climate agreement. Many economists and scientists say higher fuel taxes are essential to save the planet from worsening climate change, but that stance hasn’t defused the anger among France’s working class. Late Saturday, after announcing that the violence in Paris had been “contained,” Castaner, the interior minister, took a victory stroll down the Champs-Elysees. “People do not want to pay large sums of money … in order to maybe protect the environment,” he tweeted.